Karl-Anthony Towns could be on the move this offseason. The Sixers are adding another big piece. At least that's their goal. In order to compete with the loaded Celtics in the east, it is apparent that Joel Embiid, Ben Simmons and company need reinforcements. Will it come via trade or free agency? Well the big free agents begin and end with LeBron James — but also include Paul George. "I think another high-level free agent is required," Sixers head coach Brett Brown said. "I feel like we have the ability to attract one... I think we treat people well here, I think it's a great place to come in and be a part of a culture and a family." But Bryan Colangelo last week mentioned that it might not be through free agency, but the trade market that the Sixers embark to add a superstar. 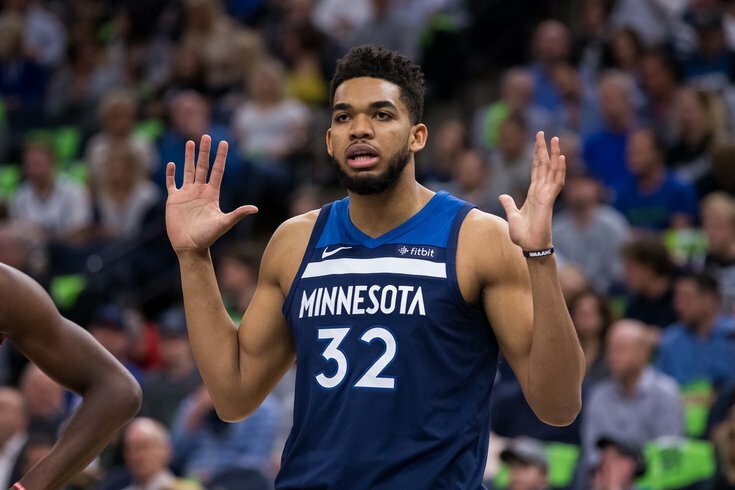 The list of big-name players projected to be on the trade block expanded this past weekend, with Timberwolves big man Karl-Anthony Towns joining the ranks of Kawhi Leonard and C.J. McCollum as potential trade targets. KAT seems like a weird fit for the Sixers, who have an All-Star center already in Embiid. But Towns does have a pretty darn good shooter's touch, shooting 42.1 percent from three. And he can score and rebound. (He averaged 21.3 points and 12.3 rebounds per game last year). A one-two punch of Embiid and Towns could be a terror for opponents and give the Sixers some Embiid insurance. So why is Towns being shopped exactly? According to ESPN's Zach Lowe, Towns and the franchise are 'not in a good place internally' right now. Fellow ESPNer Brian Windhorst piled on to that sentiment in the same podcast, speculating that, while Pelicans superstar Anthony Davis appears to be staying in New Orleans and out of trade talks, the same may not be said for Towns. Towns to the Sixers makes sense for another reason — it would be a homecoming for the Jersey native. The 22-year-old is from Edison, NJ and, as many Philly fans know, he is a big Eagles fan and got some grief for it when the Eagles and Vikings faced off in the NFC Championship. Well, at least from Minnesota fans. Towns was at the Super Bowl himself, and though the player obviously won't have the final decision on which team he may be sent to, some lobbying won't hurt. The Sixers have among the best trade bait in the NBA, boasting two first and three second round picks next season as well as a bevy of young players under team control. Perhaps Minnesota would want to take a chance that a change of scenery to a smaller media market could help Markelle Fultz? Would Dario Saric be an alluring enough part of a trade package? Aside from perhaps the Celtics themselves, Philadelphia has the most to offer in a trade this offseason. And getting in on Towns may be necessary — if for no other reason than to keep him out of Boston.